A moment's focus and they were in flooded Nagarythe. Shafts of blue moonlight lanced through the dark spires of pines, like splintered sapphire columns amidst a forest of towering corals. The dull glow of the fire flickered like red gold, horded as in the tales of the Corsairs like a sea dragon’s bed, and as the Witch Elves danced about it, their svelte, arched forms swayed as if curving shoals of sirens, circling the baited ruins waiting for the foolhardy to dive down and feed their many hungers. With the benefit of other senses - the musky reek of the orgiastic dance in her nose, the rich tang of smoke and pine on her tongue - Veysha would have despaired of the illusion. Such prompts burnt away by the stinging venom of nauglir, it was only the screaming streak of embers, swirling into the sky, that broke her free of reverie. Glowingly naked in the firelight, save a sleek kheitan of indigo dyed maiden-hide, she turned to her retainers, arrayed on the ruined steps behind. “See charted here the lives of slaves,” she intoned gesturing to the rushing column of sky-bound embers. Points of red and orange light, whizzing and wheeling frantically upwards, before winking out in the quenching ink of the night. “See the careening circles of their lives? Thrown on the winds of other men’s schemes, thrown looping in paths they think their own?” She paused and met the gaze of her audience with a dark eyes and a soft, cruel smile, "Such feckless embers as these are our enemies." The groans of the beastman scouts had become more sporadic as death had neared. Every ninety seconds she had estimated, timing her silence such that high above the fire a mournful chorus spoke now – a brief, discordant yawp of bays and whimpers. It fell away, perhaps for the last, then the soft whickering of taut rope and whispering crackle and pop of the flames was the only noise. Please check out my PLOG for pictures, background and occasional, sexed up fiction for my Autarii force, led by high functioning vixen and sociopath Veysha Everkiss. 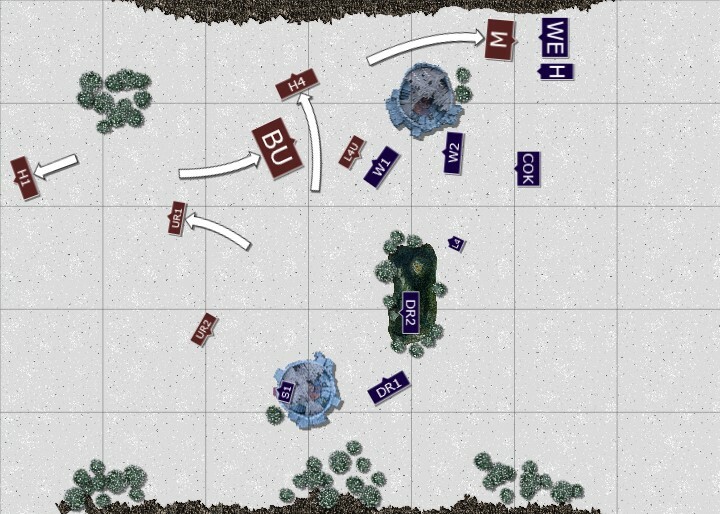 We rolled "Battle for the pass" as the scenario, which kind of freaked both of us out. Playing on the longer board felt extremely claustrophobic, but I think ultimately served me very well. Terrified by the sound of his Doombull and Giant especially, I ended up splitting my force - the heavy melee troops parked in a distant corner, with fast cavalry and the pegwitch (she doesn't have a name/fluff yet) way up front to inflict wounds and whittle as his horde marched across the board. Veysha's first turn was broadly successful. I targeted his only ranged units, the Ungor Raiders, hoping to make his march all the longer and more painful. Shooting killed 3, a little underwhelming, whilst a Warlock Doombolt took 4 from the other unit. A Doombolt from the other Warlocks took a wound off his Giant. I begin to see why they are so hated by our foes. Whilst it had seemed a good idea in deployment, my Shades behind his troops killed just one of his Great Bray's bunker. Meanwhile, the pegwitch got off IF on her Throne of Vines, prompting both of us to Google for whether the 2+ miscast ward would protect her or not... we ruled it did. I'd rolled two Dwellers, so deliberated as to whether to take Throne or Flesh to Stone, both of which I'd wanted. I took Throne reasoning that without it my other two spells would be much less useful, and it served me very well. Beastman turn one was interesting in illustrating just how dense his formations were on the narrow "Battle for the pass" format board. He charged my advanced cavalry with his warhounds, prompting a series of feigned flights which was no doubt as dismaying for him as it was glorious for me. This is my first "proper" Druchii army - when I first moved to them from Dwarves some 12-14 years ago, I still tried to play like a Dwarf with multiple RBT and massed Darkshards. Though power dice were stacked 6 vs. 2 in his favour, spell range and the dense units left his Great Bray capable of killing just one Dark Rider with the Caress, whilst his Lv2 used Wyss to boost his unit's toughness as he marched on the Shades in the tower. Meanwhile, shooting managed to kill a lone Shade in the tower, and another Dark Rider. In retrospect I should be thankful I suppose that all my feigned flights rallied themselves, but it was so "according to plan" it seemed natural them did at the time. Things were going well. The magic phase followed suit, with power dice shared 10 vs. 5 in my favour. My only recent games being practice/list honing Druchii vs. Druchii "military exercises" I hadn't really appreciated just how powerful the combination of having casters on fast cavalry and pegasi could be so early in the game. I kicked off with the Throne boosted Awakening (D6 Str 6 hits) on the Giant, adding 3 wounds to 1 from the previous round. The Warlocks followed up with a Doombolt, and though only 4 hits it was enough to kill the Giant. 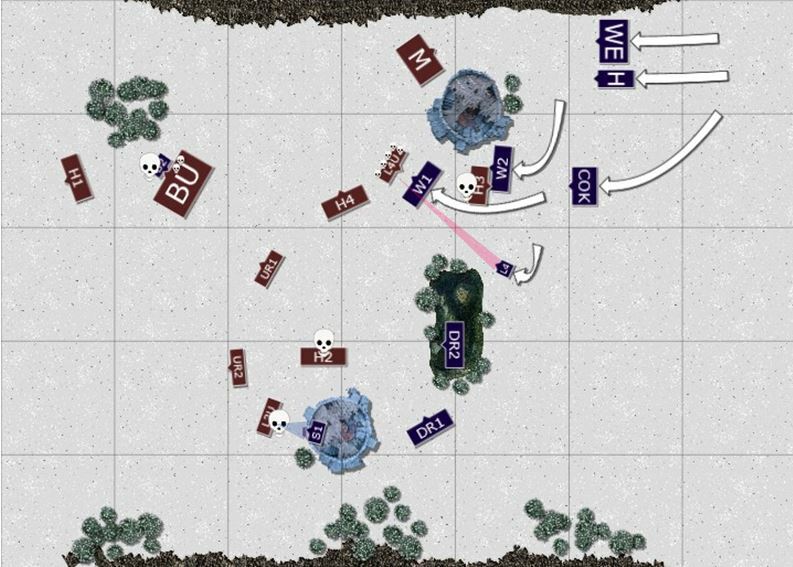 Just as we feared that missing its special attacks table might rob the game of some comedy, it fell on his outer unit of Warhounds, killing one, before they fled into the fire of my rear Shades. Elsewhere missle fire from Shades and Dark Riders whittled his scarce ranged troops further. One set of Dark Riders targeted Warhounds instead, managing to get them fleeing, but the presence of the BSB stopped it becoming the chain reaction I'd hoped for. The turn was perhaps most important for triggering a sense of panic in my opponent. Bar his Giant and my Pegwitch, his big units were as uninvolved as mine, but seeing his in the middle of fleeing troops and death, and mine stood implacably in the corner gave a slightly hopeless vibe to proceedings for a few minutes. Beastman turn 2 kicked off with a canny charge on my Dark Riders (DR2) that forced them to flee into a cul de sac with their fellows. Rather than leave them blocking the way, though, he fired upon them, killing one and panicking the other two who fled again, this time into the "mist wreathed swamp" - dangerous ground which claimed another life. His Lv2 Shaman's toughened Ungors charged my Shades in their tower. 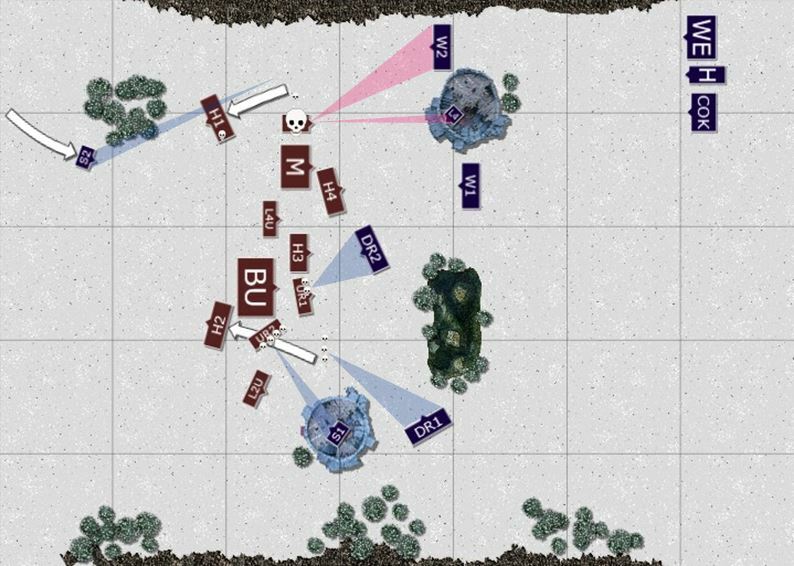 The Shades stood their ground, shooting down four as they charged, then killing another four with ASF in the ensuing melee. Though they made their Primal Fury check, no wounds were dealt in return. Despite their grim losses, however, they refused to break. As H1 continued to flee, and H2 rallied, the only other thing of note was a wound dealt to my Lv4 by his Great Bray Shaman with the boosted Caress cast with IF. If the damage was underwhelming for him, the miscast was for me - "feedback" doing a single wound to the Lv2. The wound dealt to my Lv4 was a lucky escape and with troops closing, I thought it best to move her into a more secure position. She dropped to the battlefield, with the Warlocks moving to block a long range charge and clutter the space around her. It left room for his minotaurs to advance around the tower, but whilst I was still scared of his Doombull, I felt the three pristine combat units in my reserves could deal with it unsupported. I hoped the clutter below the tower would in fact force them around that side, eager as he was to get them into combat proper. 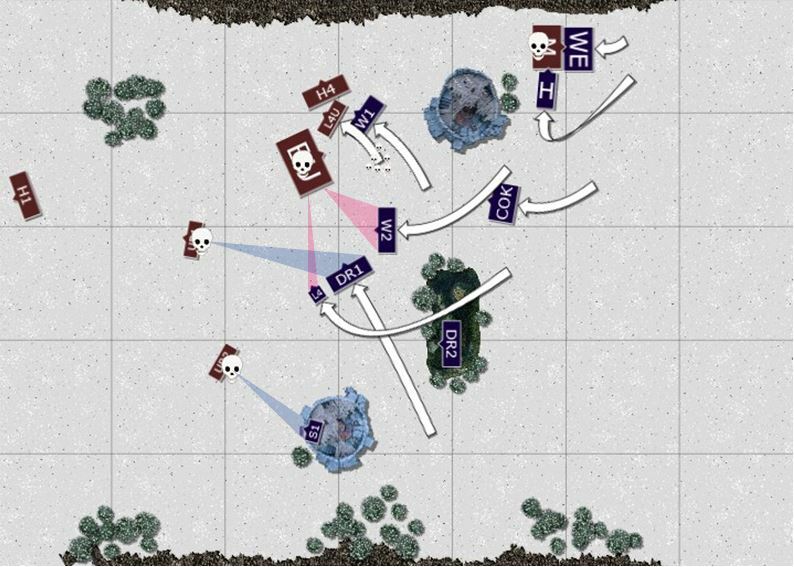 The big event came in another great Dark Elf magic phase - with the dice 7 vs. 1, and Throne of Vines still in play, I six diced Dwellers on his 40 strong unit of Ungors. When it went off I was certain he would scroll it, but it seemed he was keeping that to use exclusively on the Doombull or Great Bray. So be it! The ground opened up and pulled 22 Ungors to a gruesome, choking death of worms and cold earth. That triggered a rout - bittersweet in that it thrust 18 Ungors and the BSB straight into my Shades. 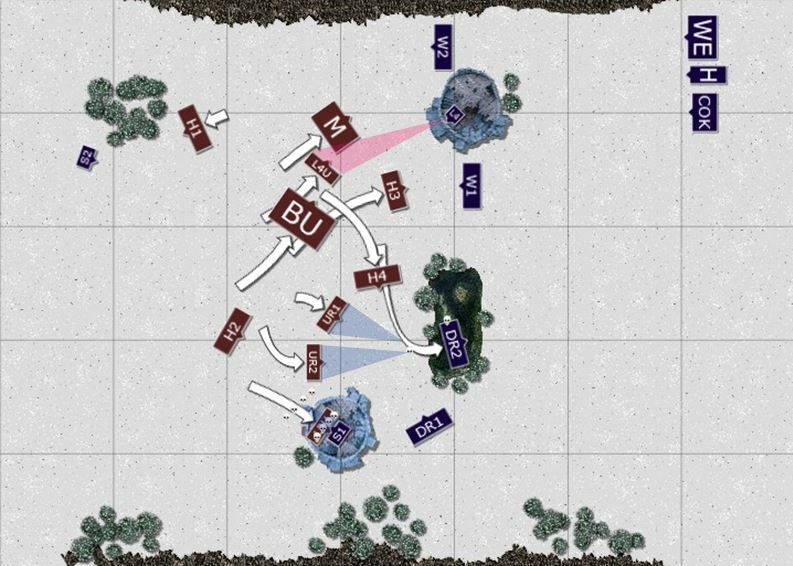 Meanwhile, the Shades in the tower killed the remaining Ungor bodyguards and routed his Lv2 - who outran them by a single inch. 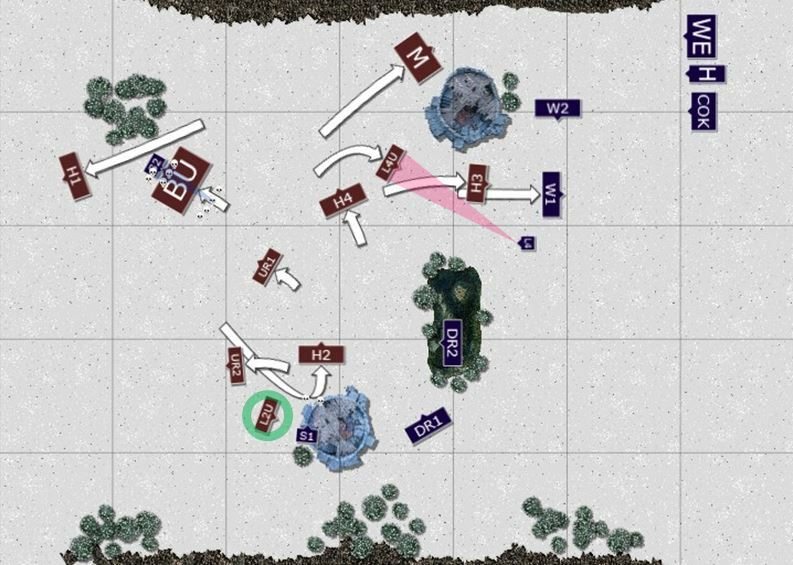 Fire from the Dark Riders then panicked his one remaining Ungor Raider in UR1 and sent them fleeing, triggering a rout from UR2 and H4. Though rallied, I left the single survivor of DR2 in the hard cover of the misty swamp. There was a (not entirely unwelcome) feeling of grim inevitability about proceedings now. Standing and shooting the S2 Shades killed four more of the rallied/charged BSB Ungors, and killed three more in melee, but lost 2 in return - holding their ground despite losing the combat. His L2U rallied to boost his toughness with Wyss. The magic phase was more significant for what didn't happen. With dice 11 vs. 6 in his favour, he successfully cast both the boosted Caress (5 dice) and Leech (4 dice) on my Lv4, and I failed both dispels. However, ward saves prevented damage from Caress and Leech failed to wound. My oppponent's one solace in DE turn 4 was that his BSB's remaining Ungors finished off my unit of Shades at the cost of two more Ungors. Meanwhile the Shades in the tower gunned down his Lv2, boosted toughness or no. I imagine the Shaman roaring in defiance even as the first dark bolts thud into his chest, before spasming to the floor as the implacable Autarii empty their weapons without mercy or pause or error. The Dark Riders (DR1) behind the tower finished off the second Warhound (H2) unit (blue arrow missing from diagram - apologies!). Both units of Warlocks charged the five Warhounds of H3, utterly butchering them before W1 overran just two inches short of the Great Bray Shaman. 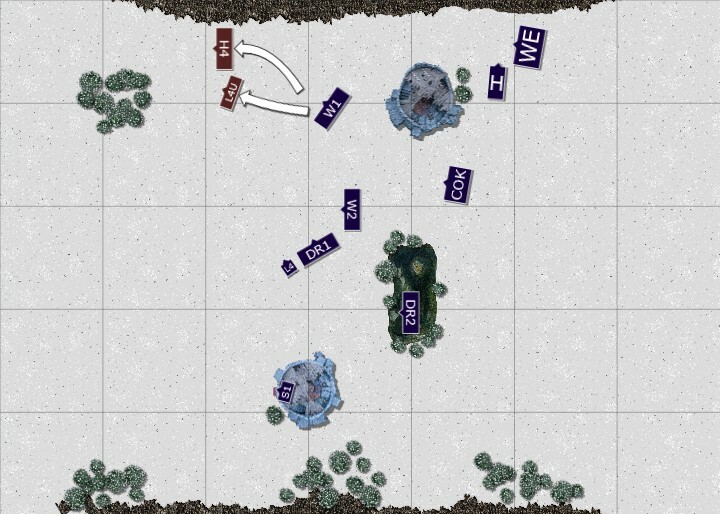 Moments before his Ungor bunker had lost five of its number to another Dwellers, cast with IF, the miscast controlled by Throne of Vines again. He dispelled the attempt to follow up on his survivors with a S6 Awakening. Having unwittingly lined up my Warlocks, Cold One Knights, BSB and General he lined up a boosted Purple Sun with six dice, and failed to cast on 20. With decent initiative one hopes most models would have saved, but it could have been gruesome. I dispelled another casting of Caress, and we both noted that his selection of Death spells hadn't suited him well - low range and poor in the cluttered space. It kind of saddens me that I moved Veysha's unit at all. As it is, she took a couple of rounds gentle trot, the second shown here, to cover potential issues that never came. The Shades and Dark Riders cleaned up the handful of Warhounds and Ungors left on the lower portion of the field, whilst the Pegwitch and second Warlocks destroyed what was left of the 40 strong BSB Ungor unit with an Awakening and Doombolt which he failed to dispel. Hopefully the movement chart above expresses my joy at the Pegwitch's mobility. Whilst his Lv4 spent the game bunkered and boxed in, unable to get range or LOS on his best spells, mine zipped around as needed. That ability to deliver force where the battle demands is a thing of beauty. The first Warlock unit charged his Lv4's bunker, slaughtering all Ungors and breaking the Great Bray. Even as he fled, the battle we'd thought be so critical came at last; Witch Elves on Minotaurs... supported by Hydra. The Witches killed 2 Minotaurs, before losing 8 of their number; 4 at the hands of the Doombull. That's when the Hydra ("Chekhov's Mongrel") had a say, roasting one Minotaur before tearing another apart, turning the outcome of the battle. 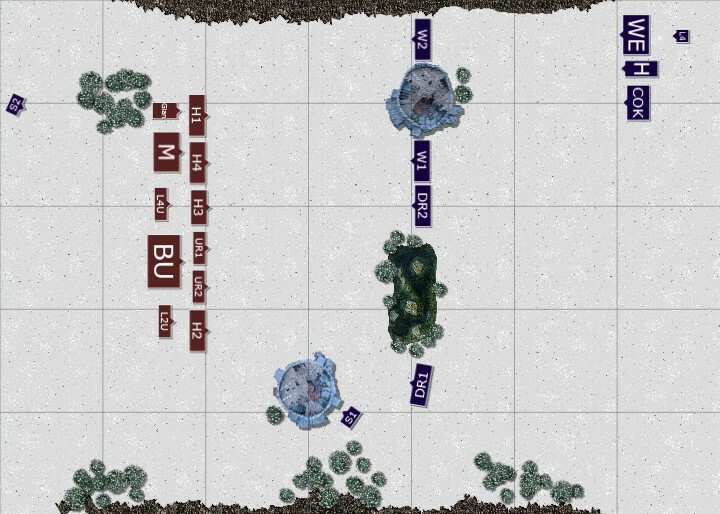 The Doombull and single survivor fled, but not fast enough for the Witches and Hydra - maddened no doubt by four turns left standing unused in the corner of the field with nothing to entertain themselves, but a cacophony of hollow shrieks, calling moans and hungry barks. Well... we did roll to see if they rallied, and they didn't. Last edited by flatworldsedge on Wed Nov 12, 2014 10:48 pm, edited 1 time in total. Thanks! It felt a little hollow since I'd worked so hard on a list and he threw his together, but I'll take what I can get. Hope to get another game with him in December, hopefully with some plastic on the table too! Personally, I would have taken a lot of satisfaction in the thoroughly Druchii nature of the strategy and tactics that enabled the victory! 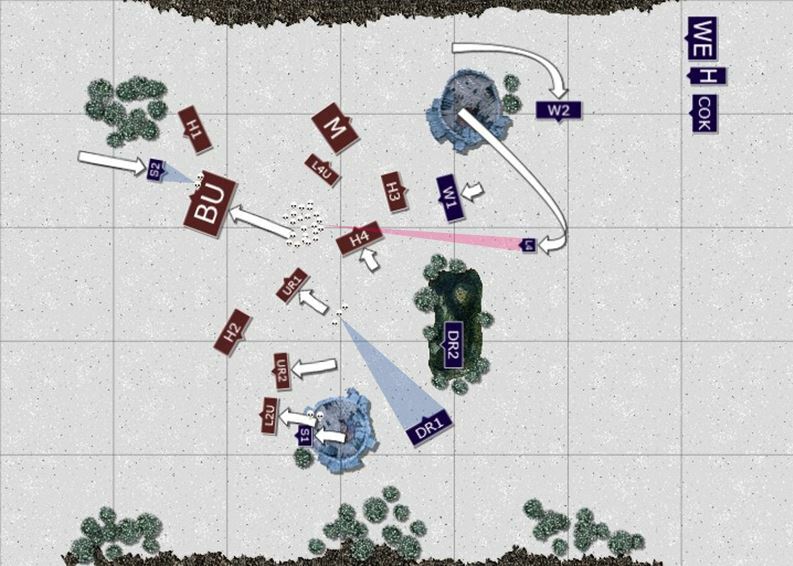 Thanks - I took the time to add the magic/shooting lines as it's something that always confuses me when reading other battle reports (which I otherwise love!). Like many things, Powerpoint and the "print screen" buttons make it easy! well played. A couple notes on some misplays I noticed in reading the report, both of them actually would have helped you more. 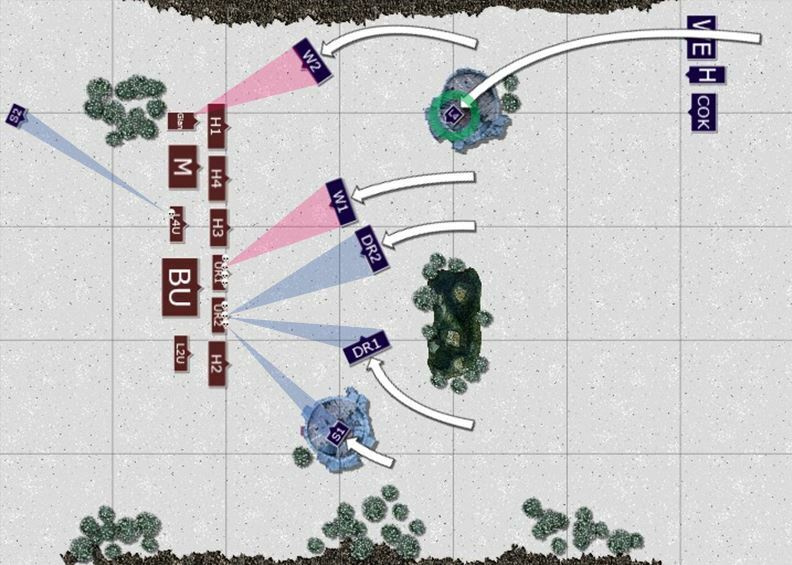 Beastmen Turn 2 - When the L2 unit charged the tower, if the unit assaulting the tower does not win combat, then they must fall back 1" from the tower, which would allow your shades to shoot them or any other viable target in your following turn. Beastmen Turn 3 - When a unit rallies it is unable to charge that same turn so his BSB unit that rallied would not have been able to charge your shades which would allow for more shooting. @Taijushue - Thanks for the notes on this. It did feel like the Shades being in a fortified position should have given more of an advantage. Great to know! If you don't my asking, would that be for any position of cover (e.g. forest) or is it specific to buildings? Regarding the rallying BSB unit, that's good to know too. I had a nanosecond's "should they have charged?" pause when typing the game up. I think we had gotten used to things rallying, then doing other stuff from all my fast cavalry, and that kind of conditioned us. I kind of deserve a couple of misplays against me, as I had suggested (when he was musing about using the special beastmen ambush rules) that if his units randomly entered the board over one of the cliffs then we'd need to look at falling damage... ! A few comments. You write from time to time that "magic was 7 vs 1". What do you mean by this? In what scenario can you get 7 power dice to 1 dispel dice, barring a snakeeye roll followed by 5 channels from you? And I absolutely love the added shooting markers. Did you know when you make reports, when you move a unit that is charging, you can select "charge" (and routed when stuff flees) and the movement arrow will turn red, adding clarity? And then in regards to the throne of vines... Its actually in the rules pretty clearly. If you cast a spell with IF, you first resolve all of the spells effects. THEN you suffer the miscast. But as throne is already up by then, you get to roll the 2+. You write from time to time that "magic was 7 vs 1". What do you mean by this? In what scenario can you get 7 power dice to 1 dispel dice, barring a snakeeye roll followed by 5 channels from you? Wow - I hope that's just an error in type up! I'll check my notes at home for the other rounds. It could be we summed them wrongly (and gave him the lowest for his dispel pool! ), but the 11v5 round suggests we were doing it right some of the time (which I guess could be deemed worse, than consistently wrong!). I'll grab my scrawled pages later and check... My normal human soul will hope to find it's a typo rather than misplay. My Druchii streak... well... not so much! I didn't know about the changing arrow colours - that's great and I will definitely use next time around. I should have a replay with the Beastmen and a H*gh Elf (hiss!) in December, so hope to do more soon. In the big movement turns the coloured arrows would be really useful - at the moment it's hard to tell which Beastmen moves are intended and which aren't! Doesn't the 11v5 also suggest it was incorrect consistently; barring channels you must have rolled a 6&5, so should have been 11v6. Looks like you were giving the lowest die roll as dispel dice rather than highest. Gosh - you must be right! I'll check later to be sure, but Lol - oh, well. As the chap with the rulebook, that's my error. #noob At least it was consistent; though with his Lv4 hemmed in with short range spells, and mine on a pegasus, it no doubt benefited me significantly more. Damn, kind of undermines things! Thanks for the perspicacity though - much rather I can update him on the error, rather than have him think it was a scheme! First, good work with both the report and the battle (OK, this in particular was expressed earlier but who cares). The shooting and magic indicators are a really nice thing. And I admire that you actually know what was shooting in which direction. One more rules mistake: the mounted sorceress was actually not allowed to land in the tower. Only foot characters can garisson a building. Not that it would mean too much in this particular battle but good to know. This battle illustrates perfectly how vulnerable are beastmen to panic checks (well, how vulnerable they were - now they can take mark of Slaanesh which makes them immune to panic). This is why most beastmen armies deploy(ed) in a compact block so that everything was close either to general or to BSB, prefferably to both. Your opponent did a mistake allowing your dwellers through on his BSB - this is probably the most important model on the battlefield for him. He should have dispelled Throne, too, at least in his magic phases. Makes you fear miscasts more at least. You utilised your fast cavalry and sorceress very well - the battle was almost won without your combat blocks. Beware, though, when you meet an opponent with more shooting. Then you can lose your warlocks quickly and suddenly your ranged presence will suffer. And your lvl4 can easily die to a single 2d6 fireball. If against someone with good ranged presence, you will have to be more careful. I think fleeing with warlocks from warhounds might not have been needed. (I assume at least that they are the same as in the WoC book which means pretty lame). Warlocks are good fighters and should be able to defeat most light troops. Imagine what would have happened if you held Turn 1: both your warlocks units would have defeated the hounds easily and after a combat reform, you might for example find an opening to the bodyguards of his mage. Or you might have been able to flank charge his giant - I do not know his rules but he is an unarmoured beast while warlocks have many attacks and poison so they might have been able to bring him down. In this particular case, I think that fighting the dogs is safer than trying to rally. Last comment: What did your opponent do with his minotaurs turn 4? If he was trying to break through, why did he go so far, allowing a flank charge? If he moved a bit less, he would force both your units to attack from the front, hopefully reducing the number of incoming attacks and not giving up a point of combat resolution. On your part, Turn 4, what was your plan with the COK? There was no unit on that side of tower your warlocks could not take care of. I think they should have been angled somewhat so that they could contribute to the charge against minotaurs turn 5. Sure, it might have caused the minotaurs to stay behind the tower but who cares? You were many points ahead at this stage. And you might have been able to hunt the minotaurs down nevertheless. Maybe you should have also tried to get a soulblight on the minotaurs through, too. Killing other units could have waited, they were not threatening you in any meaningful way. Hope you will see many other crushing victories and thanks for the report! Alternative Armies - because we can build any army without GW! @Marchosias - thanks so much for the useful critique and comments. It was you that put me onto Battle Chronicler and inspired me to do a write up at all - so it's awesome to have your thoughts here! I have a re-play of the above I played 3-4 weeks ago, and the visit has inspired me to finally type that up too! Really useful feedback too. In terms of your questions; I'm not sure about the Minotaurs in turn 4! I took lots of notes, and yet can't be sure what he intended. I remember at the time he viewed the battle as lost and just wanted to see the Minotaurs kill some Witch Elves, so think he was making sure that fight happened. It may have been a failed charge. Sorry I can't remember more! My move of the Cold Ones just after was a little indecisive. I remember thinking that everything looked under control, but that I'd bring them forward to a position where they could support either the Witches or the Warlocks depending on how things turned out. Your analysis is spot on though - the Minotaurs were the much bigger threat, and the COK could have been useful there. I was really scared of his Doombull and didn't want the dice to let him kill my general - for fluff, bragging rights, etc. - so did hang back a little. I got massively lucky with his Purple Sun not going off that turn. Could have been very nasty indeed with everything lined up for him. We'd both kind of lost concentration a little with the battle turned in my favour, I guess. Soulblight is a really good call. I still view Warlocks too much as Doombolt machines! Thanks again for the detailed thoughts and corrections - massively appreciated!